La mayoría de la gente da por sentado que el chupacabras, como sus hermanos Piegrande y Nessie, apareció hace décadas o siglos. Sin embargo, el origen de este misterioso vampiro bestial se remonta a un testigo portorriqueño que vio la película Species en 1995, en la que aparecía un monstruo casi idéntico. As well-known monsters go, the chupacabra is of very recent vintage, first appearing in 1995. However, some writers have created pseudohistories and claimed a false antiquity for the Hispanic vampire beast. These examples provide a fascinating look at cryptozoological folklore in the making. Deepak Chopra attempts to connect fundamental concepts of physics to consciousness and spirituality. He started (ab)using physics with his book Quantum Healing. But does he pass the first test of a true scientist: professional integrity? As with UFOs, some lights will remain unidentified—not because they are inherently mysterious but because they are just eyewitness reports or snapshots with so many variable factors. 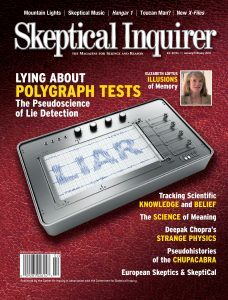 Although the polygraph can be useful in coercing confessions, it is based on scientifically implausible assumptions of accuracy and is biased against the innocent. The scientific community justly considers it pseudoscience, and it should be abandoned. Have You Seen the Toucan Man?